Adolescence is a very difficult period. Ask any teenager. Ask the parents of any teenager. Rather than a smooth transition road from childhood to adulthood, adolescence is more often a bumpy and slippery path with treacherous curves and side roads. Conflict and confusion are the hallmarks of this period as teenagers confront issues of individuality, conformity, intimacy, sexuality, and identity. At this particular stage in the process of growing up, physical, psychological, and social maturation are occurring at different rates, creating difficulties for not only the teenager, but for those with whom he or she lives. Parenting is an enormous responsibility. During a child’s teenage years, it is often easy to lose sight of the rewards. Yet, it is at precisely this period that your child most needs attention, communication, and support. The way in which you do this, however, often must be considerably different than it was when your child was younger. Failure to recognize this is one of the primary reasons for a breakdown in communications. Teenagers often communicate indirectly, so parents need to listen differently, inquire differently, and respond differently. A decline in communication. Often leading to escalating series of arguments and power struggles. A drop in grades. Attempts to show concern fall on deaf ears. Curfew violations. He or she refuses to discuss the situation or continues to make excuses. Alcohol or drug use. You see physical or behavioral evidence but get denials or arguments. Change of crowd. You begin to have concerns about new friends and little or no information is willingly provided about them. Difficulties making friends. Teen appears to be withdrawing from social activities. Anger over divorce/separation. Your teenager has difficulty adjusting to the changes and is unruly, hostile or aggressive toward one or both parents. Refusal to accept family responsibilities. Failure to take care of his or her responsibilities to others. Any of the above signals a need to get professional assistance to at least evaluate the significance of the behavior. Professional therapists are highly skilled at differentiating between common and normal developmental struggles of adolescence and behavior that is a precursor of major problems. Early intervention is crucial. It is far easier to initiate change at an early stage than further down the road. Once a teenager views himself or herself as “bad,” behavior tends to become a self-fulfilling prophecy. A professional therapist can help you and your child sort out what is going on and why. Unfortunately, some parents hesitate to involve a therapist because they feel they should be able to handle everything themselves, or because they don’t want to “air dirty laundry in public.” Keep in mind that the therapeutic process is a highly confidential one, and that the intervention of a neutral third party often provides the voice of reason, which permits everyone to move to a new and far more productive position. Therapy is neither a luxury nor an admission of failure. It is a measure of your commitment to providing the safe, secure environment that is the primary duty of every parent. Dr. Peters is a psychotherapist in practice in Glendale. 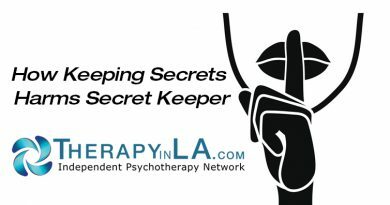 He is a member of the Independent Psychotherapy Network; and can be contacted at (818) 475-2666 or Gappsyche@aol.com. Copyright 2017 by Dr. Glenn Peters, Ph.D.